The Benefits Of Slow Cooking - What's Your Temperature? Slow cooking is healthier. Most slow cooker recipes call for fresh, healthy ingredients, and cooking for a long time over low heat allows the meal to retain more nutrients as well as avoid the carcinogens produced from high heat cooking. Also, because everything that is put into the pan is eventually put onto the plate, the precious nutrients that are contained in juices are retained as well. Slow cooking saves time. 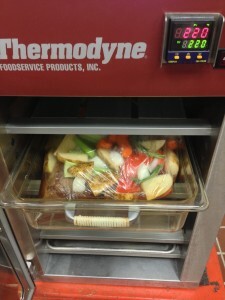 While conventional cooking may require you to be present throughout the whole process, the minimal preparation required for slow cooking is all that’s needed–the labor savings alone for slow cooking often pay off the initial investment. Slow cooking saves energy. The vegetables it cooks aren’t the only “green” thing about a slow cooker! It uses remarkably less energy than a conventional oven or gas burner, reducing your energy bill as well as your impact on the environment. Slow cooking is easy to clean up after. One pan, nothing charred or stuck onto it. Maybe a cutting board for the cutting or a pan for browning, if that’s required. Either way, you won’t be facing a mountain of pots to clean up after your slow cooking adventure is finished for the day. Ready to get started with the slow cooker? Great, we are too! Here are some mouth-watering recipes that will astound you with their ease and deliciousness. A couple extra-tasty gourmet vegetarian dishes can be found here. A recipe for belly warming minestrone can be found here. This ultra healthy vegetable stew is ultra tasty too! Mexican food lovers will enjoy this recipe for tortilla soup or pork tacos. Meat lovers will fall for this recipe for Cajun Roast Beef . Slow cooking is easy, healthy, and tasty. Why not give it a go? If you’re cooking something, we’re here to help. Be sure to contact us for more information on what we offer.